For over 50 years, J.F. Brennan Company has been providing quality mechanical dredging services to Federal and private clients alike. We have the dredging equipment and expertise necessary to carry out both large-scale and small-scale environmental remediation projects using customized excavators and duty cycle cranes. With a large fleet of over 100 portable barges, as well as massive load line marine plants, we can right-size the mechanical excavation to any project. 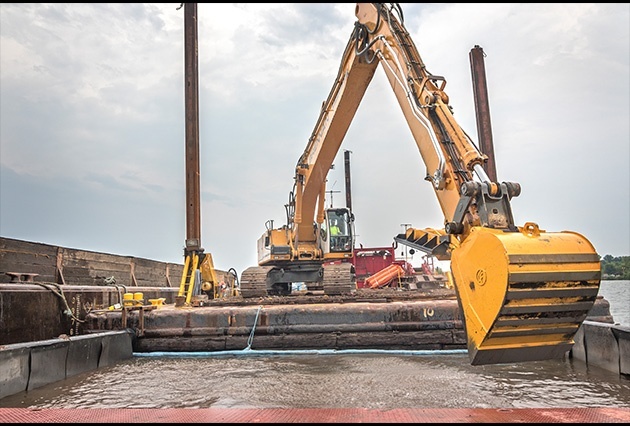 Each mechanical dredge is outfitted with state-of-the-art positioning equipment to maximize efficiency while minimizing over-dredging. Our experienced operators use the latest dredge management software for real-time production monitoring. Brennan also can implement a variety of bucket types, including environmental clamshells and proprietary innovative environmental digging buckets. 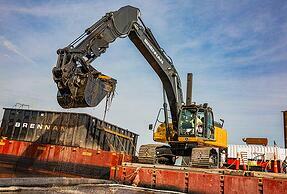 As in everything we do, Brennan introduces a high level of innovation when it comes to mechanical dredging. This includes our customized environmental G-bucket that outperforms traditional environmental buckets in both hard bottom and debris-laden conditions. These buckets are designed to dig, and when extracted through the water column they do not lose their contents if a piece of debris gets caught in the bite. These tools, in combination with a seasoned support team, deliver successful results in both production and precision. Brennan has a number of transport options that can be used in combination with our mechanical dredging services. This includes several types of barge transport and hydraulic transport options. In each case, we work with our clients to right-size equipment and scope to fit each individual project. Learn more about the 7 Cost-Drivers of a Dredging Project. J.F. Brennan Company specializes in water-based remediation and habitat restoration projects throughout the United States. We have successfully completed some of the most challenging environmental dredging and restoration projects to date. 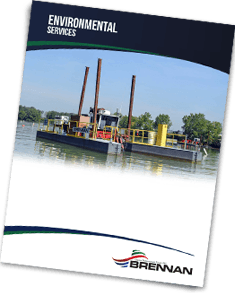 Download our brochure here to learn more about our mechanical dredging capabilities and other services that we offer. Want more Environmental Services information? Fill out the form below!